Hilda Maria Larios Dela Cruz, infant daughter of Marcos Larios Alvarez and Maria De La Cruz Ralios of Friona passed away March 31, 2019 in Amarillo. Viewing and Service were Saturday, April 6, 2019 in the Ron Smiley Memorial Chapel of HANSARD FAMILY Funeral Home of Friona. Burial following in the Friona Cemetery by HANSARD FAMILY Funeral Home. Survivors include, her parents, 1 brother, Luis Alverto Larios, and 1 sister, Maria Esavella Larios, all of Friona. Our mother, Olive Smiley Massie passed away from this life on April 7, 2019. Graveside services were held at the Friona Cemetery in Friona on Wednesday, April 10, 2019 at 1:00 p.m. with Dr. Skip Hodges, pastor of the Friona United Methodist Church, officiating. Arrangements by Hansard Family Funeral Home of Friona. Olive was born in the family home in the Duncan Flat community near Roaring Springs, Texas, April 2 1921. Her parents were David Preston and Artie Bell Smiley, and she was the oldest of six children and the last to survive. Olive was raised with a strong work ethic –having to hoe cotton and help with her younger siblings while she was at an early age, herself. She attended the 3 room school house at Duncan Flat and graduated from Patton Springs High School. Olive attended Texas Tech University for 2 years and in 1942, met and married WM Massie (Meryle), who was stationed in Lubbock while in the Army Air Force. They had three daughters, Marca Lynn Herring and Jaynette Lea Looper of Friona and Betty Merylene Massie Towle of Bar Harbor Maine. There are 5 grandchildren, Richie Herring, Kriste Herring Haile (and the late Jamie Herring and Jill Herring Cotoia), Jodi Looper Allen. Lance Looper and Aaron Towle. There are also 14 great-grandchildren and 2 great-great grandchildren. Meryle preceded Olive in death in 2004. Memories of Olive’s early married life from her daughters’ points of view, include the raising of the girls with all their various activities, including attending all their basketball games, family vacations, gardening, raising chickens and helping her husband with farm life. She also cooked three meals a day and did the laundry for her husband’s two bachelor uncles who lived with them for several years. Olive was always busy. She had a great love for nature and was very resourceful all her life, creating things from what she had and sharing many of these creations with her grandchildren. She was a multi- talented woman with a wide range of interests and hobbies. Most important, she was a devoted, loving and generous mother to her 3 daughters and her grandchildren. Olive was involved with the home demonstration club, serving as president and hosting members in her home occasionally. She was a Girl Scout leader for several years while her daughters were involved in the scouting program and continued to be a leader for many years thereafter. 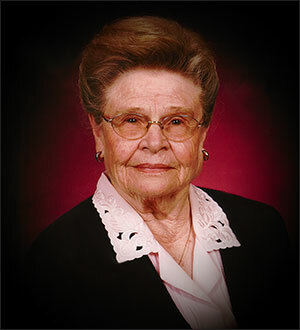 She was a Past Worthy Matron of the Eastern Star and had been a member of the Friona United Methodist Church since they moved to Friona in 1946. She had served as Children’s Sunday school superintendent and taught Bible School, and was a member of the WSCS, now called United Methodist Women. In 1961, the Massie family hosted Friona’s first foreign exchange student, Anni Jensen, from Denmark and then in 1963, they hosted Nergis Yazgen, from Turkey. They visited these two girls in their own countries and stayed in contact with them through the years. Olive and Meryle enjoyed many years of travel and had seen many different countries in addition to their visits to Denmark and Turkey. Olive’s father, DP Smiley, was interested in genealogy and did research for several years until his health prevented him from continuing. Olive inherited her father’s love for family history and spent many hours, including 2 visits to Salt Lake City Utah, to further her research. She also visited the Amarillo and Clovis libraries and joined the Friona Historical Society where other genealogists gathered to share their discoveries. In 1996, she purchased a computer and began recording her genealogy research there. A bi-product of her research resulted in contacting and getting to know many distant cousins from across the country. Her girls would say that Olive’s grandest achievement besides raising her family, was to publish three books on the family genealogy, as a result of her research. Her Turkish daughter, while visiting her a few summers ago, called Olive “a scholar”. This is a fitting tribute to this little girl who grew up hoeing cotton and helping out wherever she was needed on the farm. Her family is proud of her, love her and will miss her. In lieu of flowers, please consider a donation to the Friona United Methodist Church, the Friona Public Library or to a charity of your choice.